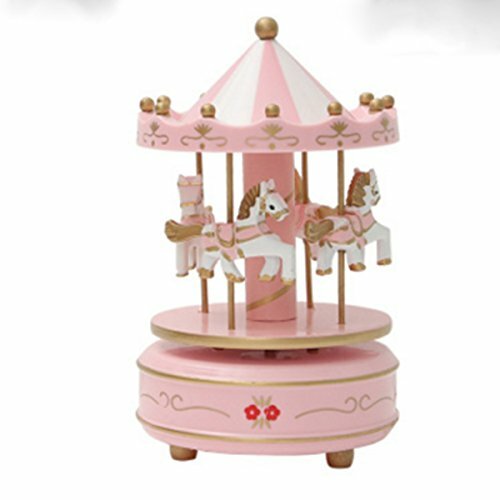 Features - Color: Pink - Material: wooden and plastic. - Size: Approx. 18 * 11 cm / 7.1 * 4.3 inch - High quality for durable and long-lasting use. - Lightweight for portable moving. - Characteristic and exquisite design with pleasant color and brightness. - Perfect home, room decoration. 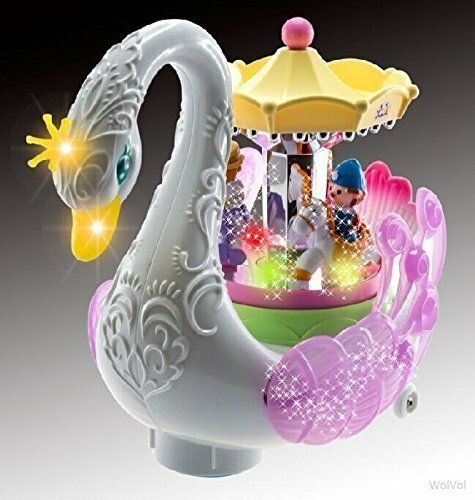 - Good toy for children to listen under their parents guide, make a nice atmosphere on paties or before sleepling. - Perfect decoration for cafe, shop, book store, living room, wedding parties and girls room. 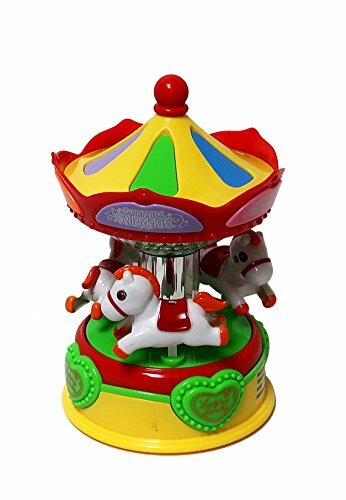 - Twist the top of the carousel, it will move and play music. 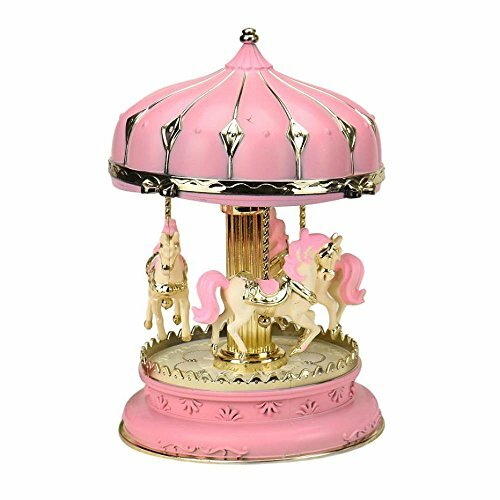 Package included: 1 * Pink Carousel Music Box Customer guarantee! We values you! If you are unhappy with the quality of your product,please contact us within 30 days for your money back! 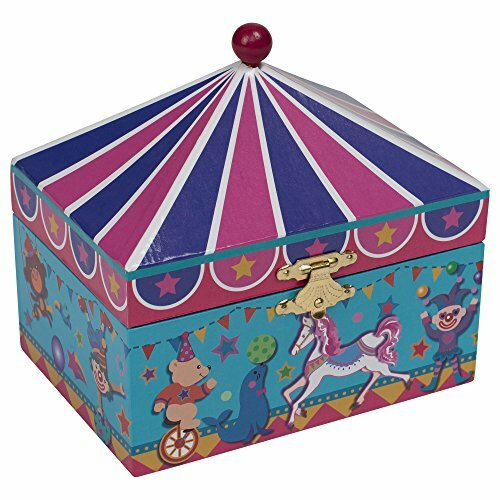 Multicolored magical stripe carousel themed musical jewelry box with spinning horse figurine inside. Features a mirror inside the lid, gold colored clasp, and luxurious velvet lined box. Traditional wind-up mechanism engages music; Plays melodic tune Swan Lake. Musical jewelry box measures approximately 6 x 6 x 5 inches. Ships in custom fit box and protective packaging. 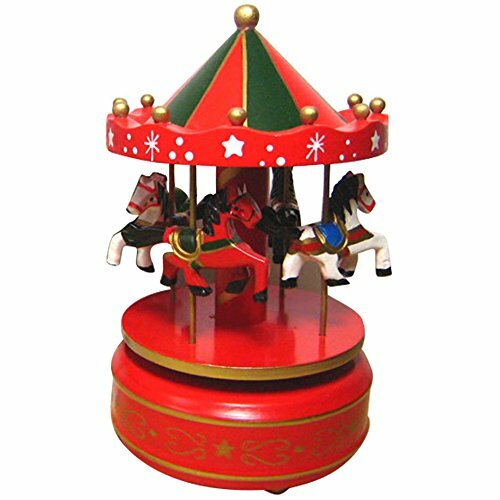 This vibrantly colored Carousel Merry Go Round will delight your toddler as it plays music and goes round and round. It also would be perfect for a baby's room as the sound, music and soft light is soothing and calming. Please keep out of reach of babies under 3! There is an on and off button at the bottom of the base. Once it is turned into the on position it will start playing music, rotating and colored LED lights will shine. When the song is completed it will stop and then can be activated by sound. Clap your hand and the next song and rotatioin starts! When completed turn the switch to off so as not to drain the batteries (batteries NOT included). This would make an awesome gift for a toddler or for a baby's room for the holidays, a birthday or just because! 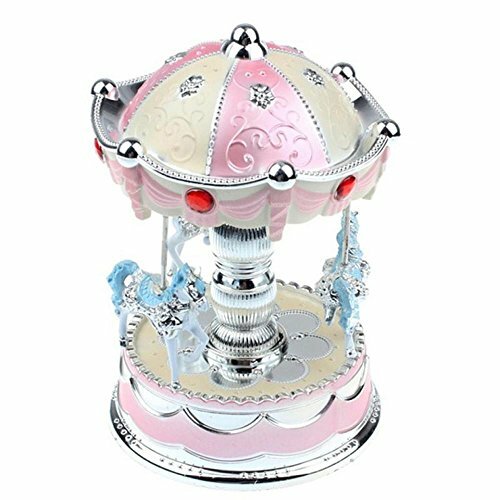 • Wonderful Music: Tune is the "Castle in the Sky", 18-Note Movement, sound power from Spring; When you wind-up, Horses can rotate along with pleasant music. 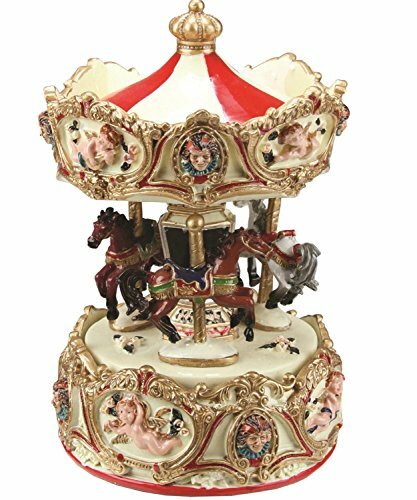 • Creativity: Handcrafted figurine depicts 3 stunning horses on a classic carnival carousel, figures are painted with exquisite detail, makes the horses painted are extremely lifelike. 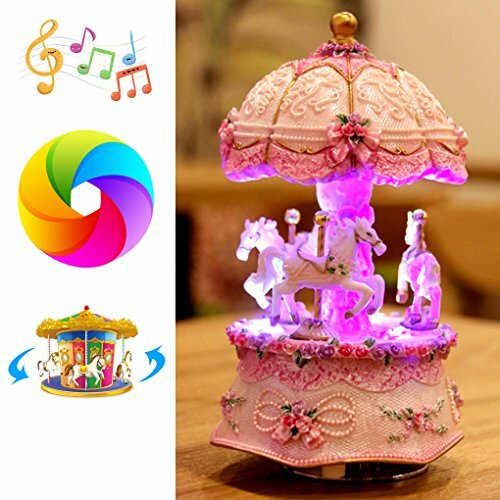 • Colorful LED Light: The music box has LED light gradient function, so the horse can rotate with the music under the shining of colorful LED Light. • Best Gifts: Suitable for any occasions: birthdays, party, Valentine's day, Christmas, graduations, Mother's day or as bridesmaids gift, maid of honor gifts, mother of the brides gifts, girl friend gifts or thanks gifts. • Top Quality: This musical box is made of high quality synthetic resin with metal windup movement, makes it environmental friendly to your skin and very durable. The approximately Dimensions: 3.5x3.5x6.5in / 9x9x16.5cm, Weight: 1lb / 430g. Looking for more Musical Horses Carousel similar ideas? Try to explore these searches: Solid Rayon Jersey Dress, Available Open Star Charm, and Ball Tie Ends. 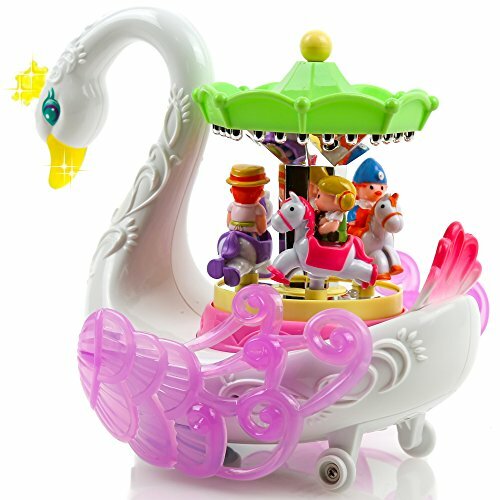 Shopwion.com is the smartest way for comparison shopping: compare prices from most trusted leading online stores for best Musical Horses Carousel, Moon Phase Chronograph Automatic Watch, Deluxe Humidor, Carousel Musical Horses . Don't miss this Musical Horses Carousel today, April 24, 2019 deals, updated daily.